Earlier this week, we had a couple of friends over for a drink, and, when the topic of conversation turned to writing, a question arose which all writers have to address. It comes in many, many different variants, but it’s basically this: where do ideas come from? It’s understandable why it crops up so often, since the generation of ideas is probably the most mysterious part of the writing process to a non-writer, and I’ve encountered several people who say wistfully ‘I’d love to write a book, but I can’t think what I’d write about’. It is, however, very difficult to come up with a response, since the real answer is either ‘from the aether’ or ‘from anything and everything’, which are both equally unhelpful. Not only is the genesis of ideas mysterious, but there seems to be a common misconception that the deal is one idea per book/story, and that each idea is hard to come by. Now I can’t claim to speak for all writers, but in my case each work – except for very short stories – will include many different ideas, in a variety of forms, some very much changed from how they started. I have hanging on my wall a mosaic picture of a view from a window into a garden. It’s made of all kinds of stuff – bits of stones, pottery, old gin bottles – now turned into something completely different. That’s very much what writing a book is like for me – scavenged pieces cemented together, involving gin. As for the question of how hard it is to have ideas, well, the honest answer in my case is that it’s not hard at all. It’s not even easy – it’s involuntary. Ideas come whether I want them to or not, from anything, at any time. The problem has never been, for me, lack of ideas – if anything, I have too many of the damn things. The hard bit is working out which are the good ones. The harder bit is working out how to stick them together to form that picture. And the hardest bit is actually sitting down and writing the bloody book. So where does all this leave someone who wants to write but isn’t sure where to start? The above might not sound terribly helpful, and indeed when I first started planning this blog post I was thinking that the conclusion would probably be that the ability to have story ideas is a bit like synaesthesia: the raw material, the sensory stimulus, is the same for everyone, but the perception is different. I can’t smell music or hear colours, most other people can’t overhear a conversation in Starbucks and turn it into a novel. But then a tiny incident occurred while I was out walking. I heard a quiet twittering, and looked up into the nearest tree – to see a male bullfinch, bright orange breast standing out against the dull grey sky. A cheering sight on a dreary day. As I was admiring the finch, a man walked by, completely oblivious, eyes on the pavement, earbuds firmly plugged in. And I thought, well, maybe having ideas is less like synaesthesia, and more like bird spotting: if you keep your senses alert and look up when you hear a twitter, you’ll see the beautiful plumage. If you keep totally focused and intent on whatever it is you’re doing, you’ll miss out on all the possibilities. Well, that’s my excuse for being incredibly distractible, and I’m sticking to it. 1. Hit ‘Shuffle All’ on your iPod. When the first song comes up, take a phrase from it, and/or record how the music makes you feel. 2. Eavesdrop on a conversation, preferably strangers. Record a brief exchange. 3. Flip through a magazine. What’s the first picture you see? Write a brief description of it. 4. Right, now you’ve got three ideas. Time to put them together and write a story! 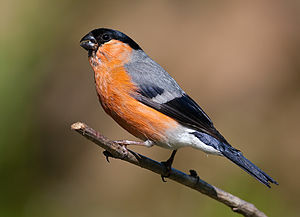 A bullfinch. They’re much like story ideas: bright, beautiful, actually quite common, but you need to be alert for them. Happy new year all, and welcome to my 2014… it’s not been a stellar year so far, but there is at least plenty of time for it to improve. And early January is always enlivened by the new shiny objects received at Christmas, including of course several books to add to the reading list. I should really try to make some more headway with said list and spend less time looking at Buzzfeed. My reading habits have been put to shame by my husband, normally quite a slow reader, who has munched through 5 books in the past couple of weeks, exhausting all available volumes of interest. So today we ventured out to Waterstone’s to get something new. It’s funny how, over the years, Waterstone’s has gradually transformed, without actually itself changing all that much. I remember when it was an ogre of the high street, gobbling up lesser shops like Dillon’s and Ottakar’s and putting poor independent booksellers out of business. Now it’s a beleaguered symbol of old school retail, under threat from the evil empire of the Amazon, a fire kindled under its profits. I don’t actually have that much sentimental attachment to Waterstone’s, not compared with late lamented Borders and its very generous approach to allowing customers to read books in store, or Blackwell’s in Oxford which nurtured me through my academic career. But I was struck today with the sheer joy of book shopping, the pulse-quickening sensation of walking into a whole building dedicated to books, and being able to wander around tables covered in books and shelves full of books, and browse through hundreds of the things, picking them up, feeling the weight, flipping through them, admiring the covers of the special editions, the gloss and the matte, the hard back and the soft, the fiction and the non. And then the excitement of walking out with a fresh purchase, longing to get home to try it out, every book a present waiting to be opened. I love reading physical books, I love having them on my shelves, and I love shopping for them. I don’t know how much longer book shops as a species will last, but I’ll miss them when they’re gone, and I’m going to enjoy them while I can.